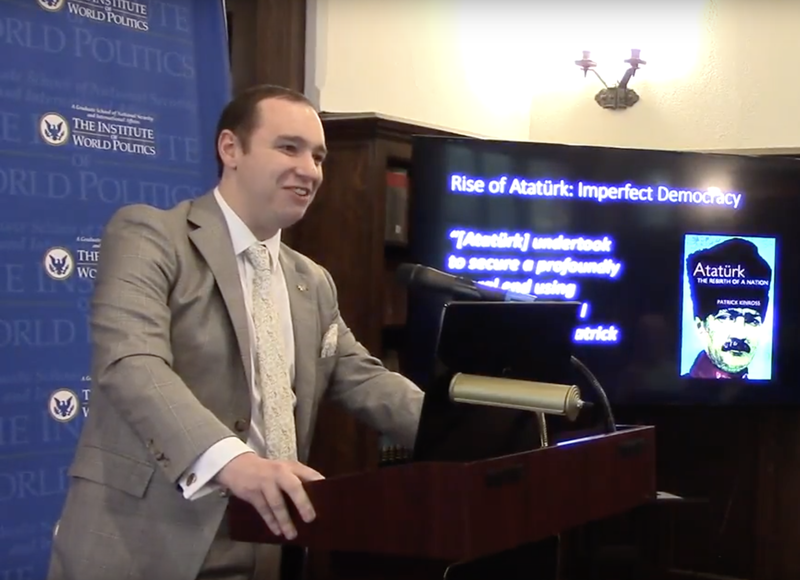 On May 24th, 2017 The Institute of World Politics hosted Brandon J. Weichert, a former congressional staffer and the founder of “The Weichert Report,” for a guest lecture titled “Erdogan’s New Ottoman Empire,” where he explored some of the ideological underpinnings of Erdogan’s foreign and domestic policy. Erdogan campaigned on the promise that he could secure Turkey amid coups, terrorism and blowback from the Syrian crisis but as Weichert argues, Erdogan’s promises of a stronger more secure Turkey are not merely responses to security concerns. Erdogan envisions a new Ottoman Empire spearheaded by the Turkish leader himself. At the root of this “neo-Ottomanism” is not only an expansionary vision but also an ideological orientation towards an orthodox Islam which imposes contradictory beliefs on many Turkish citizens. This creed of “neo-Ottomanism” under Erdogan has made Turkey’s posture towards the world and its own domestic population necessarily one of tension and perpetual friction. This has increased tensions with the EU, the United States and regional powers like Saudi Arabia–as well as internal tensions with the Kurds and moderate Muslims within the country. At its heart, “neo-Ottomanism” is not only an unsustainable venture for Turkey, but it also outlines many of the endemic problems haunting the Middle East, namely deep internal ethnic-tensions that have fomented from years of underrepresentation in domestic governments. What makes “neo-Ottomanism” so caustic is that it attempts to further subject a myriad of ethno-religious groups in the region under one ideology while ignoring the region’s complicated diversity. For Mr. Weichert, subjugation of this form took its most problematic dimension under the Sykes-Picot agreement where states were created without any reference to the ethnic dimension of their makeup. What ensued was decades of unaddressed grievances that led to militarized ethnic-tensions and civil wars. Mr. Weichert concludes with three policy objectives the United States and its allies should undertake when attempting to address regional stability in the future: redrawing of the map to overlay actual ethno-religious fault lines instead of those established by the Sykes-Picot Agreement, addressing ISIS, and finally addressing Syria by removing Bashar Al-Assad and the Alawite ruling party so that Syria’s majority can be better represented and appeased. Previous What Is NATO Good For Today?